Some of you already know that I like optimizing things (modules, applications), regarding speed and scalability. For optimizing, you typically benchmark and profile. 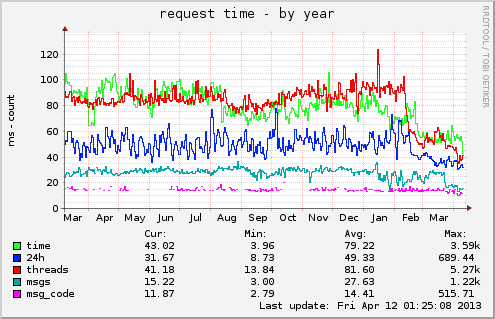 Regarding web applications, what I find very helpful also is observing request duration over time. I'm using munin for displaying the data. My forum software has been running live for 4 years now. Regarding its features it's quite similar to perlmonks. So there is a lot of data to fetch with every request, apart from the actual page content. I'm doing a lot of caching with memcached. Some of the data is only cached 1 minute; for example the list of online users. As a consequence, the request duration can vary a lot, depending on the traffic. If there is high traffic, most of the requests get their data from memcached, so the requests are faster; with less traffic the requests have to fetch more from the database, so they are slower (which is ok though, when you don't have much traffic). I'm saying this because this can influence the statistics about the request duration. Keep that in mind and observe the number of requests also. (By watching at the apache requests plugin or by writing a plugin which only counts the script requests; the latter might be more useful). Another disadvantage is, that the displayed average request duration is not the real average. Munin fetches data every 5 minutes and displays them in the daily graph. For the weekly graph, you get the average of the 5-minute-average, and so on. So if there is a timeframe with very few requests, for example 3 requests which take 100ms each, and another timeframe with 100 requests and 40ms each, the cumulated average will be 70ms. That can lead to some unusual peaks, but in general it's useful. Now, if you do an optimization, you can observe (ideally) that the line in the graph goes down, and how much. I find this highly motivating and helpful to estimate other optimizations I'm planning to do in the future. It can also help convincing your boss/team manager of doing an optimization. Especially using memcached (and/or something like Lucene/ElasticSearch) can make your application much more scalable, or alternatively save a number of machines. For me the most important thing is the request duration of forum threads (the red line). You can see how it decreased during the last months, because I made several optimizations. (The other increases and decreases are mostly results of different traffic amounts). # munin will assume 0 which will falsify the statistics. This script will be called every 5 minutes. First, you should of course install munin. On Debian, install munin, munin-node and possibly munin-plugins-extra. Make your script executable and put it into /usr/share/munin/plugins/requestduration. Create a link /etc/munin/plugins/requestduration to this script. In the next run it will appear in the Apache category. Don't get frustrated when starting a new plugin, because it usually takes some time until you see a helpful graph and get a feeling for the numbers.